LED headlights are currently one of the most desired options on new cars. They have a lot of desirable features over comparable HID or halogen bulbs, and have a level of cool associated with them which has followed on from HIDs. 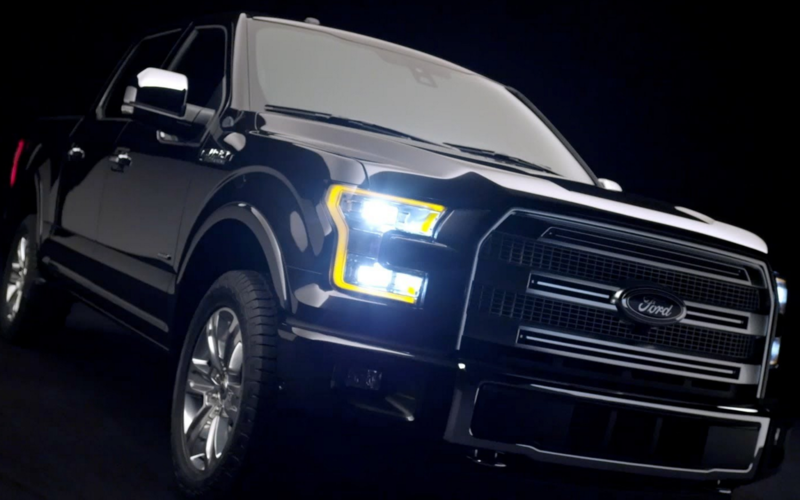 They are the new ‘it’ thing for cars, and manufacturers are not passing up on the opportunity to charge hundreds of dollars for LED headlights as an optional extra. Fortunately for us the aftermarket scene has taken up the mantle of providing affordable LED lights for all. They’ve also tried to make it as easy as possible for us to install them. As such we’re left to make a choice between one of the many LED headlight bulb kits on offer. Each one ostensibly offering us the same package, but each with its own up- and downsides. To that end we’ve rounded up five of the best products to help you get on your way. Headlight bulbs come in a variety of sizes which can affect price and performance. To help compare products within this article, all information is provided with reference to the H11 (H8, H9) light bulb. It is used both as a low-beam headlight bulb as well as a fog light. Most manufacturers offer light bulbs in all standard headlight sizes. Opt7 are a Californian based manufacturer of aftermarket lighting components. Starting off in the entertainment lighting business, in 2006 they started up a headlight division focusing on HID lighting. Ever since they’ve continued to innovate and design their own products to growing acclaim. Currently they market a number of LED and HID products, for headlights and other aspects of automotive lighting. 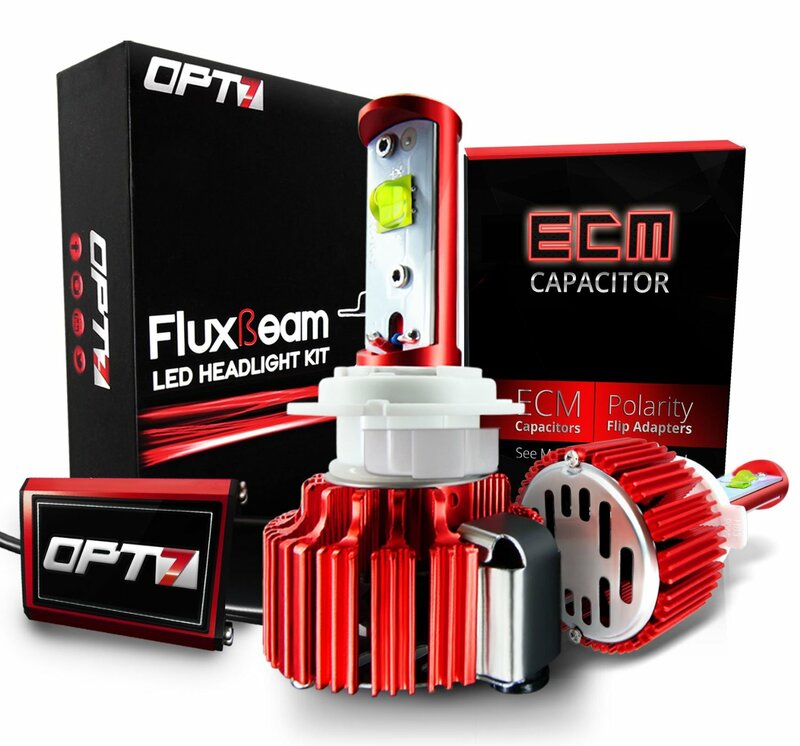 Opt7 have just released their FluxBeam X product. However, their flagship FluxBeam LED headlight kit is still extremely capable, and may see a price dip in the near future to make way for the X. The FluxBeam went on sale 18 months ago and is one of the most popular products on the market. Opt7’s marketing pushes a lot of improvements over similar HID technology, for instance the fact that the bulbs are instant on, not requiring any warm-up time. Furthermore, the lifespan of 50,000 hours is ten times more than a comparable HID light. The biggest contributor to this is Opt7’s improved cooling system with Modular Heat Protection. This includes a cold-pressed aluminum heat sink that stays 30% cooler than generic heat sinks and a powerful cooling fan that spins at 7,000RPM cooling with twice as much force as a generic cooling system. The FluxBeam LEDs are designed to be plug ‘n play, ensuring the easiest installation process. Coupled with their CAN bus ready electronics, you should have this kit up and running well within Opt7’s claimed twenty minute installation time. Opt7’s product has been top of the standings for quite a while and rightfully so, with an average customer review rating of 4.3-stars from over 2,800 reviews it is no wonder. The fact that they’re based in the US and are able to offer top-notch customer service goes a long way to avoiding the 1- and 2-star ratings which can plague overseas manufacturers. Customers are generally impressed with how bright the lights are and how easy they are to install (although this can vary depending on your vehicle’s setup). When driving at night visibility is improved, especially with regards to signage and road markings. The one concern that some customers appear to have relates to the so-called ‘throw distance’ of the bulbs. While they accept that the bulbs are bright, they feel that light is focused just in front of the car, and not far ahead of the car where it is more useful. This is hard to corroborate, and can have a number of causes, including car specific setups. JDM Astar are another California based headlight manufacturer. Similar to Opt7 they started out developing aftermarket HID kits and have over the years expanded their market. They now offer a multitude of different LED and HID products for various applications, as well as having several products within each market. Their G2 product range is an entry-level product on the JDM Astar lineup, featuring the Seoul Semiconductor CSP LED chips. Their cheapest product is the G1 which sports Bridge COB chips and are $10 cheaper. One of the ways JDM Astar manage to keep their price down on this product is by dropping support for CAN bus enabled vehicles. Many new vehicles, especially of European origin operate their lights and some other peripherals making use of the CAN bus communication protocol. While other products such as the Opt7 LED headlights include the required electronics to recognize this system, this JDM Astar product does not (they do offer products that are compatible). For many people this won’t be a problem, and they’ll be happy to save the thirty plus dollars they would have to spend to get a suitable set of LED headlights. It’s important to recognize this difference though. Otherwise the G2 is a solid offering. It features a similar cooling setup to the Opt7, although the JDM Astar only guarantee 20,000 hours of operation (still well beyond any reasonable person’s expectations of a light bulb) with a 1-year warranty. The G2 manages a slightly higher 4.5-star customer review rating, however this is from only 55 reviews. The one or two complaints it did have complimented the product on its brightness, but complained of experiencing premature failure. For years PIAA has been the go-to manufacturer for high performance halogen headlight bulbs, so it’s great to see them sticking their feet into the LED arena as well. Established in 1963, PIAA have constantly been developing new performance products for the headlight industry. Currently a large portion of their focus is on the racing industry where they have made a name for themselves as manufacturer of bright and durable products. Although PIAA’s products (LEDs and others) can be fitted to normal headlight housings, they make the point of noting that their products are meant for auxiliary lighting purposes only, and thus get around the legal aspect of headlights. Furthermore, their products are not designed to work with CAN bus systems and their instruction manual lists several potential problems you may run into such as flickering and error messages. That being said, PIAA’s product is one of the few that come with an easy to use mechanism for adjusting the position of the LED within the headlight. Not all headlight housings are created equal, and allowing one to adjust the LED’s position results in better light distribution and minimizes the chances of light scatter. The bulbs feature a dual-speed fan embedded in the heat sink to ensure cooling and are designed for plug ‘n play use, requiring no cutting of wires. There is however one small problem with the PIAA’s. They cost over $250. That is a lot of money to pay for a set of headlights. They’re an amazing set of headlights, supported by customer reviews which all give it a 5-star rating and glowing recommendations. To be fair though, it’s from only six reviews. The three big names in halogen headlight bulbs (Philips, Osram Sylvania and GE) have been slow to get into the LED game, most likely due to the grey area that LED bulbs fall into when it comes to legislation. As such we see Phillips advertising these bulbs as fog lights and in their product description stating that they are for fog use only. Obviously trying to avoid any responsibility from people installing these as LED headlight bulbs. Regardless, it’s nice to see one of the big three releasing a consumer LED product. Philips is a big organization with a rich electronics history that have always had a focus in the lighting industry. They are an original equipment manufacturer (OEM) which makes their 4.1-star rating (lower than others in this review) rather concerning. Firstly, we have to note that a lumens brightness rating is not given, but the power draw is only 9.3W per bulb. This is considerably less than its competitors, but this is understandable when you consider that Philips intend this to be used only as a fog light, and not as a headlight. The lower power rating is supported by the fact that the bulbs have no cooling fan, making use only of a heatsink designed base to dissipate heat. If you’re looking for a good pair of LED fog lights and you’re willing to stomach the $120 price tag, then this is the way to go. 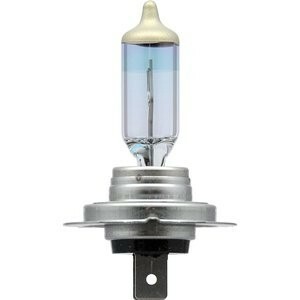 Please do not buy these as replacement headlight bulbs. They do have a few negative reviews (which explains the low customer review rating) where people have experienced the bulbs failing in less than 6 months. Although an annoyance, they do come with a class-leading 3-year warranty, so you should have no problem returning these for a replacement set should that happen. Kensun made their name developing a cheap HID replacement kit and sold tens of thousands of sets. They still are selling them, but last year managed to put together an LED offering as well. As a result, Kensun has a great following in the aftermarket headlights market and is generally well-regarded. Their LED kit comes in their customary aluminum carry case and features additional color filters, meaning you can opt for the normal white light, or switch it out for a blue or yellow light if you’d prefer. American made Cree LEDs are the power house for the bulbs, cooled by an integrated fan and heatsink setup. Installation is straightforward with all the electronics contained within the bulb itself resulting in a simple plug in to the car’s connectors. This does raise concerns over the car’s CAN bus compatibility which is not discussed in the product description. Customer reviews are a bit scattered, but the Kensun still manages a 4.3-star average rating. A number of negative ratings follow a similar trend to other LED products with concerns about the throw distance of the lights, and instances of bulbs failing in less than 6 months. There’s a lot to choose from in the LED market. If you’re exploring LEDs for the first time, make sure the bulbs are going to fit. Not only do they come in different sizes, but LED bulbs can be a bit more bulky than conventional halogen bulbs due to the required cooling on LEDs. You might find some interference with your car’s internals. Otherwise you have a good selection of products from which to choose. Depending if you need a CAN bus guaranteed product, the light color you’re wanting and how much you’re wanting to spend, you can find a product to suit you. Once you’ve selected the product that you want, be sure to give the customer reviews a check and look for someone who has mentioned installing them in the same car as you own. It’s a quick way to do a compatibility check and avoid later problems. It’s difficult to choose a best LED headlight bulb from the above list, as they have different features which would appeal to different people. If it’s a headlight you’re looking for we can probably exclude the Philips product, and sadly few people will be up for paying the $250 for the amazing PIAAs. Of the other 3, if you need a CAN bus ready product Opt7 is the one for you, otherwise the JDM Astar is a good bet.